This is the best subcompact crossover for you if you’re looking for big space in a small footprint. 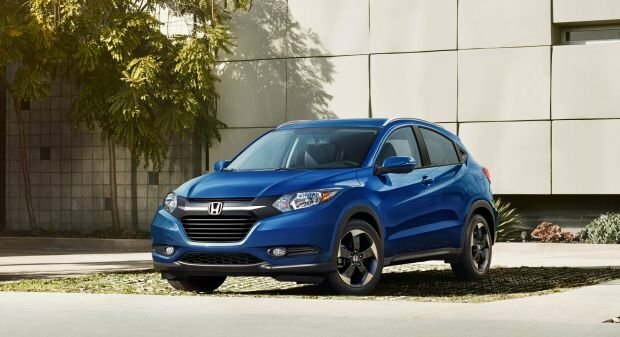 Honda’s tiniest crossover debuted as a 2016 model, slotting below the compact CR-V in size and price. A new paint color and an alternate wheel design are the sole model-year ’18 changes to a five-seater that exemplifies the automaker’s gift for packaging efficiency. Indeed, the HR-V – the name has no specific meaning – boasts best-in-class passenger room and, thanks to Honda’s innovative “Magic Seat” rear bench, is unrivaled for cargo versatility. It’s an interesting class, to be sure. The 2011 Nissan Juke was arguably its first entry and now the segment is contested by more than a dozen nameplates. Young families, youthful urbanites, and empty nesters are gobbling them up: sales rose 11.5 percent segment-wide through the first three quarters of 2017. The Jeep Renegade continues at No. 1, followed by the Subaru Crosstrek and the HR-V. The Nissan Rogue Sport joined the fray for model-year ’17, while 2018 newcomers include Ford EcoSport, Hyundai Kona, Kia Stonic, and the wildly styled Toyota C-HR, the only entry that doesn’t offer all-wheel drive (AWD). The 2019 HR-V is slated for a midcycle update, so wait for it if you’re interested in freshened styling and upgraded features. Anticipate visual tweaks to exterior details, perhaps front and rear fasciae acquiring some of the bold shapes and scoops found on Honda’s Civic car. No change to basic dimensions or engineering, although the manual transmission available on front-wheel-drive models may be dropped. Expect the Honda Sensing suite of driver-assistance technologies to become available. That would bring the ’19 HR-V up to date for safety features and make it eligible for coveted “Top Safety Pick” status from the Insurance Institute for Highway Safety. Honda Sensing includes autonomous emergency braking, automatic steering to correct unintended lane departure, and radar-based adaptive cruise control to maintain a set distance from traffic ahead. The 2019 refresh will also present Honda an opportunity to improve this crossover’s customer-satisfaction scores. Honda as a brand scores high in owner surveys conducted by influential research firm JD Power. But the HR-V rates a subpar two on a scale of five in Overall Quality and a merely average three of five in Overall Performance and Design. Honda almost certainly will increase prices on the ’19 HR-V, so buying an ‘18 gets you essentially the same vehicle at a cost lower to start with and probably headed lower still as dealers shed inventory ahead of the spiffed-up 2019 model. 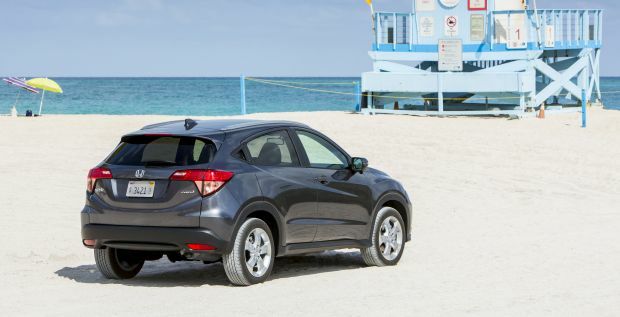 The ‘18 HR-V is affordable, cleverly designed, and easy on gas. The lineup reprises three trim levels: base LX, better-equipped EX, and flagship EX-L Navi (navigation). All share the same four-cylinder engine and a choice of front- or all-wheel drive. Front-wheel-drive versions of the LX and EX are available with manual transmission. Optional on those and standard on the EX-L Navi is a continuously variable automatic transmission (CVT). Traction-aiding AWD is optional on CVT-equipped HR-Vs.
Styling: Only detail changes to a look that’s fairly conservative and a shape certainly more graceful than that of stumpy rivals like the EcoSport and Chevrolet Trax. For 2018, Aegean Blue Metallic is a new color choice for CVT-equipped models. All models retain 17-inch alloy wheels, but those on the EX and EX-L Navi are of a new design with trendy, black-painted inserts. The HR-V’s exterior dimensions are about average among subcompact crossovers, but it’s roomier inside than most. Entry and exit are easy, thanks to a low deck and doors that open exceptionally wide. Once situated, headroom and legroom are outstanding for a vehicle this size. The dashboard is pleasantly functional if understated; it’s most interesting feature is the uninterrupted channel of climate-system vents occupying most of its passenger side. LX models come with a 5-inch central display screen; the other models get a 7-inch touchscreen. Cabin materials are serviceable, with some thin-feeling plastics to remind you you’re in a budget-sensitive vehicle. Honda’s clever, multi-hinged “Magic Seat” rear bench is standard. Its seatbacks fold forward to create a low, flat load floor. The lower cushion also can hinge rearward to transversely accommodate wide items, such as a big-screen TV box. 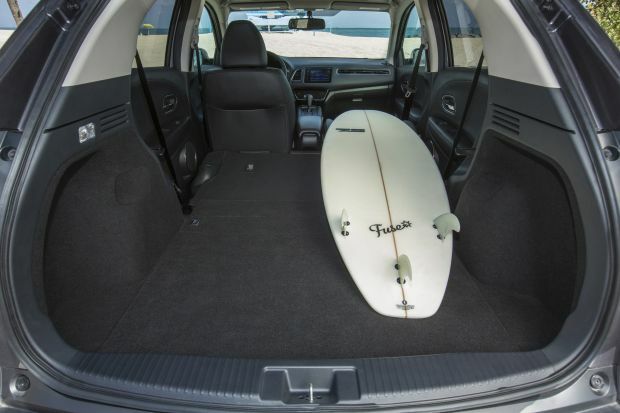 With some 23 cubic feet behind the rear seat and about 58 with it folded, cargo volume approaches that of some larger compact-class crossovers. Mechanical: Nothing new here. All HR-Vs continue with a 1.8-liter four-cylinder engine of 141 horsepower and 127 pound-feet of torque. The front-drive LX and EX return with a 6-speed manual transmission as standard. The CVT automatic is an $800 option on these grades and standard otherwise. More than 90 percent of buyers choose the CVT and another half of those will spend an additional $1,300 to add AWD. No HR-V is quick. Manual models come closest — they weigh the least — and the transmission is fun to shift. A CVT performs the duties of a conventional automatic, but without stepped gear changes. That can make for an unusual sensation of the engine racing ahead of actual vehicle speed. Honda’s is more responsive than most, but the CVT and AWD combined add up to 200 pounds to the HR-V, blunting acceleration in the process. The combo performs fine for the around-town driving, but leave plenty of room for highway passing and merging. Handling is what we expect from a Honda: precise steering, fine body control, and good lateral grip, given the modest tire size. Those road manners come at some sacrifice in bump absorption. Road noise can become intrusive on coarse pavement, as can the engine drone associated with the CVT’s high-rpm habits when you use lots of throttle. The AWD system is a good traction advantage in snow or on gravel. But with just 6.7 inches of ground clearance, about an inch more than that of a subcompact car, you won’t be doing serious off-roading in an HR-V. In this class, look to the Jeep Renegade and Subaru Crosstrek for that. Features: No changes, which means HR-V feature-set continues to lag that of top competitors. Already mentioned is its lack of up-to-the-minute driver assists. Another missing technology is Apple CarPlay or Google Android Auto, which would allow you to project your GPS map apps on the dashboard screen. Oddly, the HR-V’s infotainment system interface is otherwise identical to that in the Civic, which does include CarPlay and Android Auto. Honda will likely rectify these shortcomings as part of HR-V’s 2019 refresh. On the plus side, a wide-angle rearview camera and Bluetooth connectivity are standard on all HR-Vs. The EX adds to the LX heated front seats and mirrors, keyless entry with pushbutton ignition, automatic climate control, and Honda’s LaneWatch video camera, which can project on the dash screen a view of your right-side blind spot. Expect the midcycle refresh to kill LaneWatch in favor of a more traditional blind-spot alert system that also includes rear cross-traffic detection. The EX-L Navi is the only HR-V model with imbedded GPS mapping, which, unlike smartphone apps, provides complete real-time navigation functionality even when there’s no cell signal. Also exclusive to the EX-L is leather upholstery, satellite and HD radio receivers, and roof rails. No change in Honda’s policy of forgoing extra-cost options in favor of providing each model with a specific equipment set, although numerous dealer-installed accessories are available. Prices for the HR-V LX and EX rise $105 for 2018, and EX-L Navi versions are up $100. Even with these slight increases, the HR-V remains one of the more affordable entries in the subcompact crossover segment. Note that the prices listed here include Honda’s $940 destination fee. The front-wheel-drive LX with manual transmission is priced at $20,510. The same model with the CVT is priced at $21,310; adding AWD brings it to $22,610. The EX grade is priced at $22,560 with manual transmission, $23,360 with front-wheel drive and the CVT, and at $24,660 with AWD and the CVT. EX-L Navi versions come with the CVT and carry a factory sticker of $25,980 with front-drive and $27,280 with AWD. Our pick for the best balance of feature content and fun-to-drive character would be a manual-transmission EX, which seems like a bargain with its under $23,000 sticker price. Even a loaded EX-L Navi with AWD isn’t a bad deal either, especially since its built-in GPS mapping function makes up for the convenience of a dashboard-screen CarPlay or Android Auto interface. As its drivetrain is unchanged, so too are HR-V’s 2018 EPA fuel-economy ratings. Manual-transmission models rate 25/33/28 mpg city/highway/combined. With the CVT and front-wheel drive, ratings improve to 28/34/31 mpg. AWD HVRVs are rated 27/31/29 mpg. All use regular-grade 87-octane fuel. The model-year 2019 refresh will see the HR-V through to its next full redesign, likely around model-year 2021. The midcycle update will likely update styling with the design language of the newest Civic and recently redesigned Accord. LaneWatch will almost certainly be gone, along with possibly the manual transmission. Addition of Honda Sensing and the latest connectivity would be welcome. Chevrolet Trax, beats HR-V for ride comfort but falls short for passenger and cargo room; Fiat 500X, a mediocre crossover from a brand that can’t seem to find its footing in North American; Toyota C-HR, a surprisingly disappointing entry that’s slow, loud, cramped, has terrible visibility, and isn’t available with AWD. Mazda CX-3, at least in terms of feature availability and driving enjoyment; Nissan Rogue Sport, which feels quicker while being quieter, riding better, and offering more safety and connectivity features; Subaru Crosstrek, redesigned for 2018, boasting impressive room and off-road prowess at competitive prices.